I've been bad about the picture taking. I can only do so much at one time people! 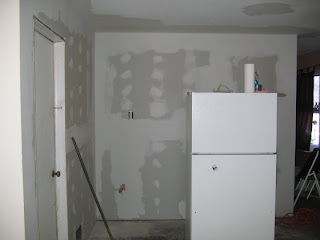 Anyway, as you can see the drywall is almost completely up. A vent pipe needs to go in before the other section can get drywalled. But now the two 36W x 38H windows are now framed out. The one on the left was re-framed from a 92W x 25H slider, believe it or not. I'm keeping the sliders in the bedrooms and bathrooms, but I thought the front of the house would look more normal with double hungs. Plus, the smaller double hungs cost a lot less than sliders that size. 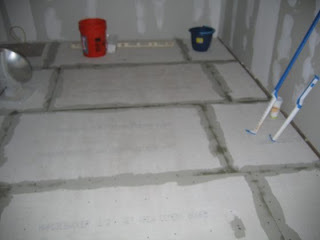 The Hardibacker is down and sealed with thinset. First the joist in the middle (since the first contractors apparently didn't know how to use a level) was uneven, we had to sawzall it off. Then we stomped on it to push it down and renailed it so it was as level as it could get. Man, it's always something, isn't it? 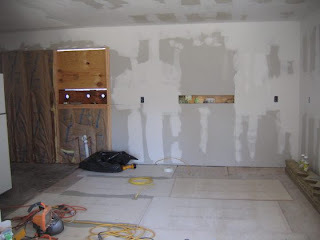 The hardest part of this remodel has been not having a sink, stove or oven. I'm not a big fast food eater. I'm also not a big microwave person...other than popcorn. Eating all this processed food is making me physically ill. 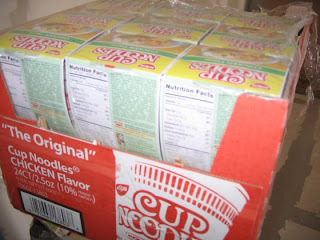 I picked up this package of Cup of Noodles just so I'd something quick and easy to make. They're actually pretty good, I just wish one cup didn't have 49% of the sodium I need all day. It doesn't even taste salty! Ugh. And don't suggest fruit and veggies. I hate eating things I had to wash in the bathroom sink. The water in there tastes all sorts of weird. I had to load our strawberries up with sugar not to notice it. Double ugh.